Right by Lake Geneva... A welcoming retreat where privacy is considered essential. The unique Rotary hotel creates the perfect setting for an exceptional getaway. 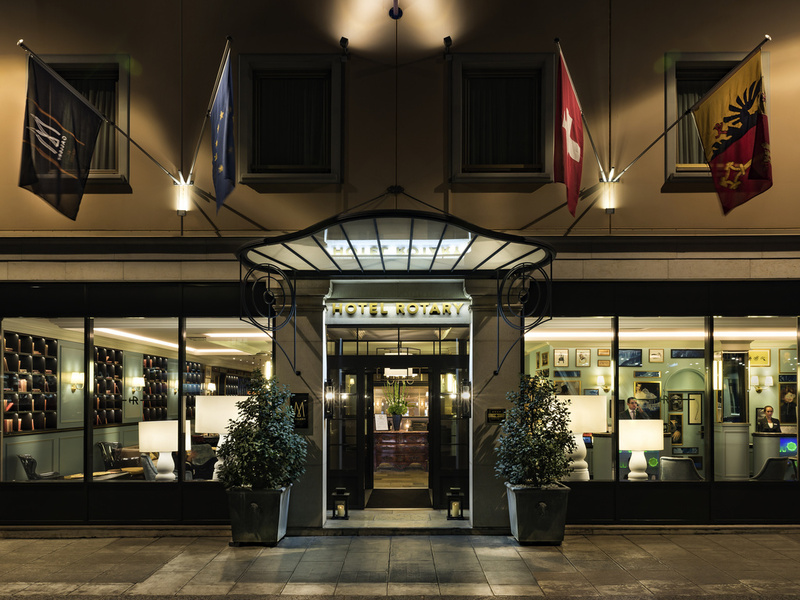 At the very centre of Geneva, in the business district, the hotel opens its doors to reveal a stunning, refined and completely renovated setting. The rooms themselves give the guest an unequalled travel experience with luxurious comfort and a subtle blend of classic and antique furnishings. In winter, relax by the fire in our bar, and in summer, enjoy your favorite cocktail on the terrace. The restaurant features a summer terrace with a decorative water fountain. It serves French and international cuisine. In a comfortable spot by the fire in winter or on our terrace in summer, our barman invites you to discover his signature cocktails and a wide selection of wines available by the glass, 80% of which are from Geneva. Centrally located but not pricey (for Switzerland); not impressive but functional; competent personnel; restaurant closed on weekends, which is a shame. Comfortable hotel conveniently located near Geneva station and the lake. Staff very pleasant and helpful. Very easy to walk out from hotel and find everything needed from restaurants to tourist sites. Breakfast every morning was very nice and so was the one lunch that I had. Two downsides:- 1. For some reason in the room British television BBC 1 TV was Northern Ireland regional broadcast and not England main channel which was very annoying as I wanted main not regional TV channel. I don't understand why. 2. Proximity to lifts and rumbling sound at times late was not helpful either. I would however stay there again. A nice hotel. High quality design and furnishings in the hotel . The location is 2 Minutes walk from the lake, very central and perfect for business and sightseeing. I had a very quiet room. Very competent and friendly staff. Would book the place again. Swift check-in, friendly staff, well appointed room, all very good. Very nice and luxury hotel. Beautiful design, cosy rooms, high quality, very correct service from a very kind staff. Spotlessly clean, very friendly, good linen, very kind prsonal, excellent breakfast, Very relaxed and vey close to the banking area. Enjoy! Pleasant stay - very good food! Very nice rooms, good service overall and a fantastic restaurant with excellent dinner menu. Fantastic service, clean rooms and a great location. Rooms had quality beds and the deco made for a relaxed and comfortable feeling. The bathrooms were a bit small and not a fan of showers in bathtubs but the shower itself functioned well with good water pressure. The hotel was very pretty and well located. The front desk staff were most pleasant and very helpful with dinner recommendations and sight seeing suggestions. I would definitely stay here again. Conveniently located, expensive for what you get, shower leaks when you run water and makes the bathroom floor slippy (not good). Plesant staff and no upgrade for a Gold member. Lovely hotel, strange surprise at check-in. Name confusion at check-in with an American sharing same name. Why? You had my gold card number on the BCD booking form. Did it perhaps cost me an upgrade? Why three days later have the points not yet been added to my account? Iris on check-in extremely nice and very professional on dealing with the confusion. My husband and I had a wonderful time in Geneva and we enjoyed this hotel. The service was attentive, the bed was comfortable and the gym was well equipped. Room was odd as had upper seating area. We didn't use this at all as it felt strange. The stairs encroached on the room as a result of this loft area and put the TV offset. The bathroom was very small for a room of this type and not in keeping with the room. The top of the wardrobe had not been dusted in months and room felt a bit tired and dirty.